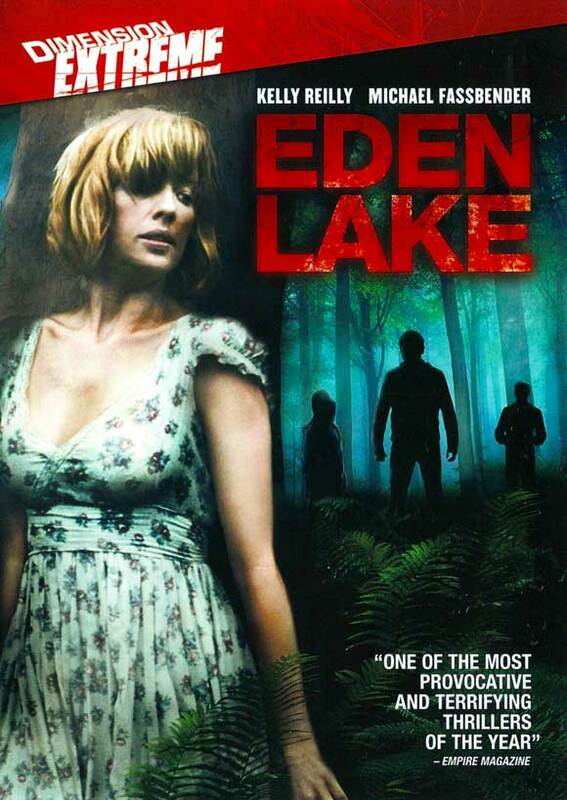 Eden Lake is story without the supernatural. No aliens, no vampires, no zombies. The only monsters here inhabit this small town on the outskirts of the woods. They look like us, but do not be fooled- there is no telling what they are capable of. Don’t mess with them. Kelly Reilly (Flight) and Michael Fassbender (Prometheus, X-Men: Days of Future Past) star as lovers Jenny and Steve on their way to their vacation destination. Steve’s plan is to bring Jenny to a secluded area in the woods to propose to her. When they arrive at the flooded quarry of Eden Lake, they have no idea what pain is in store for them. There first mistake was getting on the troop of wandering kids’ radar. When the loud and obnoxious hooligans won’t let up with their rude behavior and obnoxiously loud music, Steve decides to intervene. From there, things escalate quickly as the rascals and the lovers go back and forth raising the bar with each other. The terror is more realistic and cerebral in Eden Lake so it might be better off considered a thriller than a horror movie. Either way it is bloody enough to make the MASSACRE MARATHON so I’m glad I watched it! The leads do a good job of making sure the level of authenticity of their ordeal comes across, but certain lines and actions written into the script come across with over dramatics and sympathies at the wrong times. If I held a stop watch up to time how many minutes Jenny wasted instead of getting help I’m sure the number would be ridiculous. Jack O’Connell, who plays the mean-spirited ringleader of the gang (Brett), does a great job of making me hate his character and I look forward to watching him portray a young troubled teen adapting to prison in Starred Up (some time after my horror stint of October). The decision to leave the male lead behind and proceed with making Jenny the main protagonist did not bother me, but I was sad to see the great acting of Bassfender exit the screen so early. He was pretty much the reason I decided to watch Eden Lake in the first place and he didn’t get to do all that much. I got the message that Brett must have been abused at an early age and I understand what type of psychological damage that can do to a boy but to go as far as he did without letting up or showing the least bit of remorse is kind of unbelievable. The last scene bothered me when, instead of calling the police after what their monstrous children did, the parents decide to become accomplices. Yeah, it showed the adults were just as bad as the kids but I think any parents would be disgusted with their kin if they acted out like this. Apparently, remorse is not a term discussed in their town. The lack of scares kept me in the “meh state” but I would still recommend this as a solid thriller with an ending that really comments on society’s way of raising kids. This entry was tagged brutal, Eden Lake, Flight, Horror, Jack O'Connell, Kelly Reilly, MASSACRE MARATHON, Michael Fassbender, October, Prometheus, spoilers, Starred Up, X-Men: Days of Future Past. Bookmark the permalink.